Season tickets are no longer available for the 2018-19 season. Season brochures were mailed out in the middle of last May. Season brochures for 2019-2020 season will be available in May of 2019. Tickets are now available for purchase and exchange for all the remaining shows in our season. The next upcoming show is You Can't Take It With You. Broadway's greatest farce takes comedy back to its roots, combining situations from time-tested, 2000-year-old comedies of Roman playwright, Plautus, with the infectious energy of classic vaudeville. 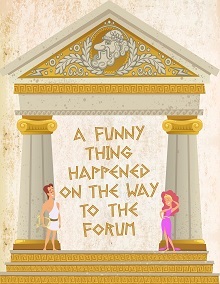 A Funny Thing Happened on the Way to the Forum is a nonstop laugh-fest in which Pseudolus, a crafty slave, struggles to win the hand of a beautiful, but slow-witted, courtesan named Philia for his young master, Hero, in exchange for freedom. The plot twists and turns with cases of mistaken identity, slamming doors and a showgirl or two. This unforgettable, hysterical musical has "something for everyone, a comedy tonight!" Programs presented by others and fund raising events have their own special event pricing. Please see the individual listings for pricing information.